Coming into today's game against Slovakia, the United States' offense was being questioned by many. These questions came on the heels of back-to-back 2-1 losses to Russia and Canada, games where both goals came off of the stick of Jacob Trouba, a defenseman. 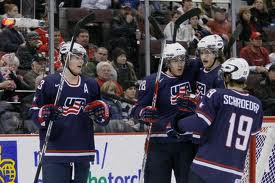 However, U.S. coach, Phil Housley did not buy into the concern with his team's offensive abilities. In an interview with NHL.com, Housley commented on the situation, "But, right now, in these last two games, we've had chances. We just need to bury one of those early ones or get a bounce." The U.S continued to get those chances in today's game and converted often, as they cruised to a 9-3 victory over Slovakia. Seven different players found the back of the net for the U.S., which included four goals with the man advantage and two, two goal games, by John Gaudreau and Vince Trochek. Goaltender, John Gibson, recorded his second win of the tournament. As the number three seed in Pool B, the U.S. clinched a spot in the quarterfinals and will face the the number two team of Pool A, which will be decided at the conclusion of the games for that pool later today. The quarterfinal game is set for Wednesday. Early signs point to a second round that could feature matchups with the U.S., Canada, Russia, Sweden and Finland which would make for great hockey. I would like to get more information about those teams. Could you, please, add something here?